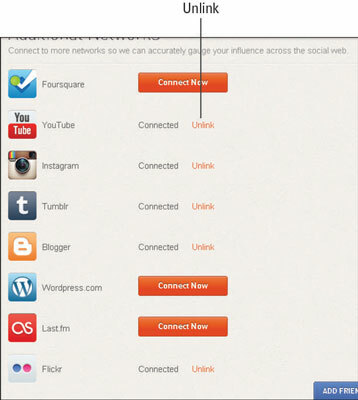 You have the option of connecting many of your social networks to Klout, but you can also remove them if necessary. While adding social networks is a way to improve your Klout Score, you may want to remove one if you are no longer using it, so other don’t try and connect with you on an unutilized network. Before removing, consider the advantages of added social networks. The benefit of adding networks is that you have a more accurate Klout Score. Klout is continuously trying to make its algorithm more accurate and add data from an increasing number of sources. If you use most of your networks publicly, adding them to Klout makes sense. If you decide that you want to disconnect a network from Klout, it’s a very straightforward process. Make sure you are logged in to Klout.com by signing in in the upper-right corner of the screen. Mouse over your name and select Settings from the drop-down menu that appears. Select Connected Networks from the list of options on the left side of your screen. Locate the network you wish to disconnect from Klout and click the Unlink link. The page refreshes and next to the network, you see the Connect Now button next to the network icon. This means that particular network is no longer connected.